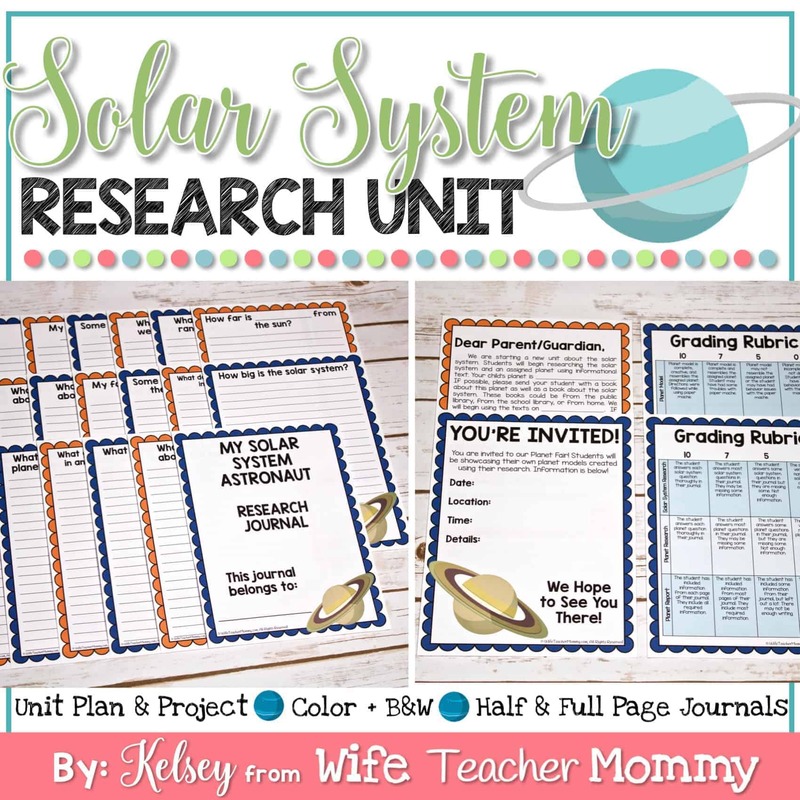 This Solar System research unit is perfect for helping students learn about the solar system and write their own planet reports! It is great for students who are learning how to use informational text and studying outer space. Students can conduct traditional book and/or internet research. Everything you need for a successful unit is included in this packet! For the best deal, grab this resource as part of the Science and Social Studies Research Units Mega Bundle! Students will first learn how to use the text features in informational text including the table of contents and index. They will also learn how to find credible sources on the internet. Then, students will be assigned a planet (and optionally, a partner or group to work with). Students will have a Solar System Research Journal that they will use as a guide as they research about the solar system and their assigned planet. Editable sections have been added to the research journals so you may add your own questions! Once students have completed their research, they will use it to complete two culminating activities: a report/presentation and a paper mache planet. Finally, other classes and parents will be invited to the “Planet Fair” where your students can show off their cool paper mache planets! Teacher Info Pages: This includes a sample unit outline, grading rubric, and lesson plans for internet research, intro lesson, research journals, and final projects. Book research/ text features worksheets: Students will review other text features including: glossary, titles, headings, photos, captions, graphs/charts, and special print. They will also compare and contrast the table of contents and index. Internet research worksheets: These worksheets will familiarize your students with how to find credible sources on the internet for research. Planet Cards Cards with the name and clip art of each planet. You can use these to assign students a planet to research. Research Journals: The research journals will guide the students throughout their research. There is one question on each page for the students to find the answer to. 19 pre-written pages are included, plus 2 blank ones to add your own questions. Full page and half page versions are BOTH included in this resource. Choose which version is best for your students. Parent Letter & Holiday Fair Invitation: Keep the parents in the loop! Let them know what is going on with the holiday unit, and invite them to the planet fair, if you decide to do one. Final Report Pages and info: A final report page is included as well as examples and lessons to have students create a paper mache planet of their state. You can also grab this resource as part of a bundle! Save 30% with the Science and Social Studies Research Unit Mega Bundle! Need only Science? You can save 20% with the Science Research Unit Bundle. By purchasing this resource, you will have access to it on your account for the lifetime of WifeTeacherMommy.com! We do not limit how many times you can download and access your resource. Computer crashed? Not a problem! Just log into your account and download it again.